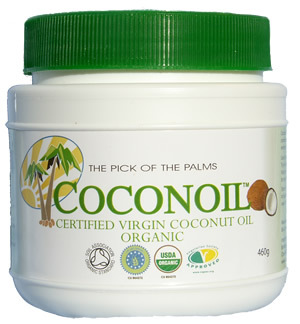 So I looked for UK sellers of Coconut Oil and found Coconoil that do an organic “baby” size, which was good enough for my experiments. My main worry was that butter doesn’t give off a competing flavour, it can be used in any recipe, if I used coconut oil, would everything taste of coconut? The first recipe I tried was Coconut and Nutella thumbprint cookies, this is a twist on the Nutella and Bran cookies I posted last week, to try and bring out the coconut flavour. In this I substituted the butter with 3/4 of the stated amount of coconut oil. I will post the recipe later on, and I have to say I was very impressed. The smell doesn’t overpower, although there is a detectable coconut aroma from the oil. The texture is very like softened butter, and it creamed in the sugar as I expected. All in all it was rather a success! I tried it again last night, this time in a different recipe for apple and banana slices, again I will post this recipe later. Another great success, and this time it alleviated my worries that everything would taste like a bounty bar! My main reason for the substitution will always be the health benefits, it has a much lower cholesterol (which is something I think we can all do with), but for once I don’t feel like the health benefits detract from the taste or the overall enjoyment of the food. See all my coconut oil recipes.